It’s our favorite time of year to celebrate sewing; National Sewing Month! Scroll to the bottom of the post to see the winners of our National Sewing Month contest! If you love to sew like we do here at WeAllSew, you probably have a favorite place to sew. Let’s take this opportunity to celebrate where you love to sew. 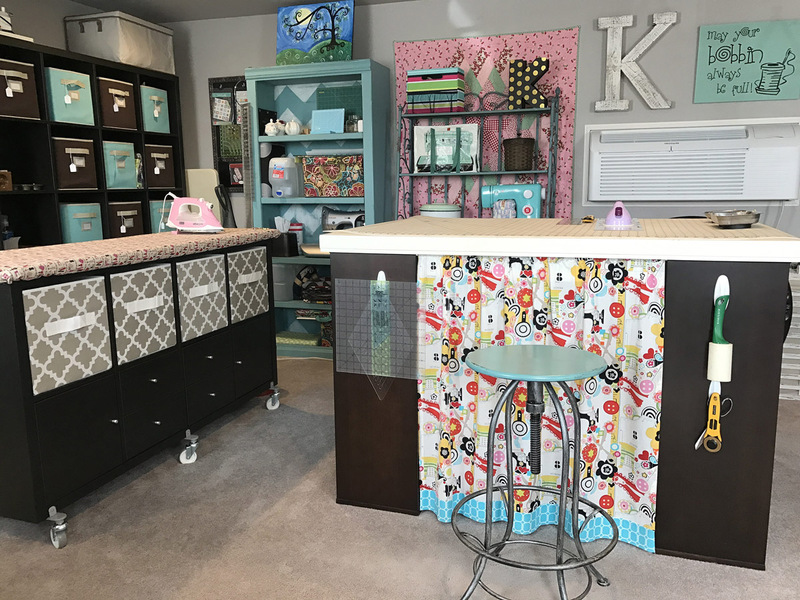 Whether it is at your kitchen table, your stylized sewing room or in your attic, we would love to see your sewing space! And while you share where we create and you can win great prizes, too. Share images of your favorite sewing space with us at our Community section here at WeAllSew, and enter to win one of our sensational sewing prizes! 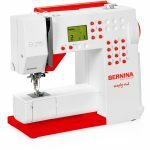 All entries will be reviewed by a BERNINA panel of expert judges, and one lucky grand prize winner will receive a new B 215 Simply Red sewing machine! Are you ready to show us your sewing space and enter the Celebrate National Sewing Month contest? The first step is to make sure you are registered to the WeAllSew blog. If you are already registered, click here to read a step-by-step tutorial for uploading to our Community section, then create your own post. 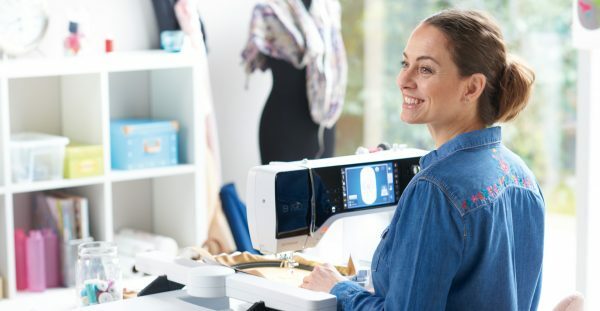 You can upload from 1 to 12 images as a maximum, and add a description of where you love to sew. 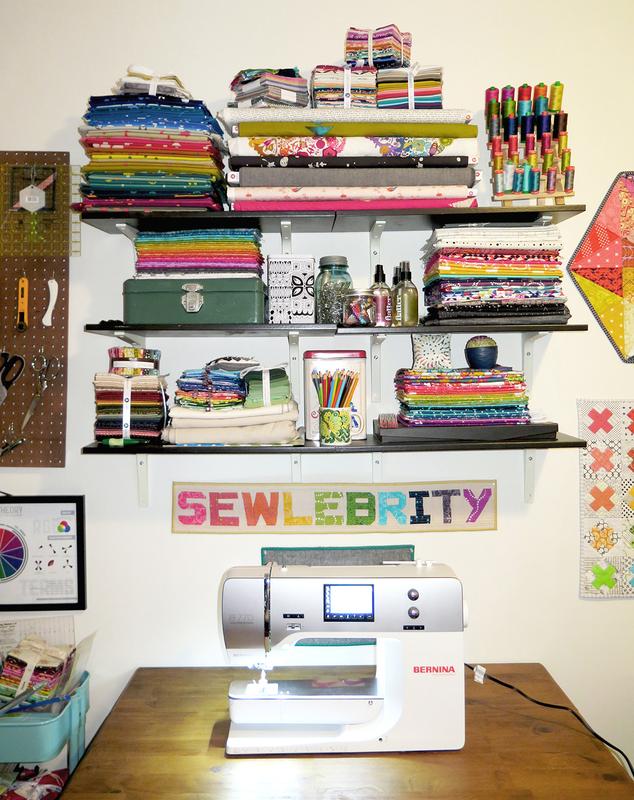 Thank you to all who entered and shared your amazing sewing spaces with us! No matter you sew on the kitchen table, a corner, or a room of your own, we love to see where you create. Congratulations to Kim Jorgensen, our Grand Prize winner! Kim’s prize is the BERNINA 215 Simply Red! Kim shared her Pieceful Farm Quilt Cottage with us. Congratulations to Michael Holmes, our Second Prize winner, his prize is the Tula Pink Shears! Michael shared his quilting room with us. Congratulations to Debbie Meador, our Thrid Prize winner, her prize is the OLFA Ergonomic Rotary Cutter! 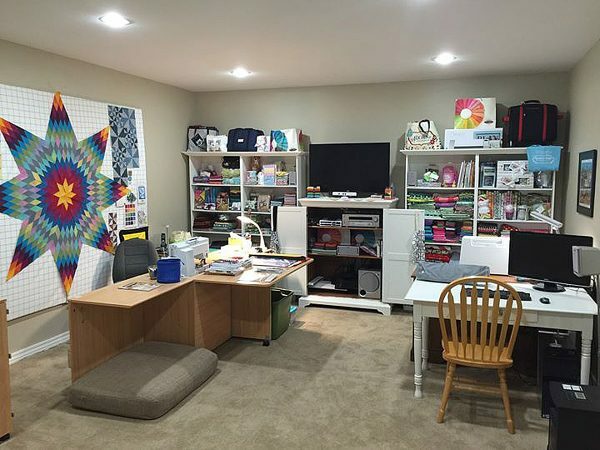 Debbie shared her empty nest sewing room with us. Click here to read the official rules. ELIGIBILITY: Open to legal residents of the 50 United States and the District of Columbia who are 18 years of age or older. The following individuals are not eligible to enter or win a prize: employees, contractors, directors, and officers of BERNINA of America, LLC. (“Sponsor”), its parent, subsidiaries and affiliated companies, and the web design, advertising, fulfillment, legal, judging, administrative, and Sweepstakes agencies involved in the administration, development, fulfillment, and execution of this Sweepstakes (collectively, “Sweepstakes Parties”), and the immediate family members (spouse, parent, child, sibling, grandparent, and spouse or “step” of each) and those living in the same household of each such person (those persons whether related or not who live in the same residence for at least three months during the twelve-month period preceding the start date of the Sweepstakes). SWEEPSTAKES PERIOD: The Sweepstakes begins on September 1, 2017, at 9:00:00 a.m. Central Time (“CT”) and ends on September 30, 2017, at 11:59:00 p.m. CT (the “Sweepstakes Period”). The Application server is the official clock for this Sweepstakes. Got a real sewing space last year and love it. Will post a photo if I can figure out how how. I will send a picture also if I can figure out how. I have tried sending a picture but I guess it didn’t get done. will try again. I am going to celebrate bysupporting my local Bernina shop. I plan to take a couple of classes and purchase some fabric. I will probably add to my collection of feet too. I love my sewing room. Best place in my home. I sew in my spare bedroom. I have a table setup for my Bernina 1008. I have a surface to the left with a small cutting mat. On the right I keep handy, anything I may need. Its not a very organized space but it works for me. I will clear this up every several projects and pull out what I need till it gets out of control, then start over. I sew nearly everyday, I make Crazy Quilts. I sew nearly everyday, It is meditative and relaxing.I make Crazy Quilts. I really like looking at where others create! I could dream about the perfect space all day….or get busy sewing! I think I’ll stick to the latter! 🙂 My room pic is posted and here’s hoping for a win! This is very exciting. I love my sewing area. I could hang out in there everyday but work to buy fabric. Have my Bernina’s waiting for me! My laundry room is also my sewing room. Sew almost every day. I finally got my dream machine the Bernina B 790. I could sit and embroider all day!! I do not have a dedicated space in which to sew, so I’ve carved out a small space at the foot of my bed to place my machine. My sewing machine, fabric and chests of notions are intertwined in my living room, which is large and bright. I took over my son’s bedroom when he left for college. Surprise! when he came home. I love having a whole room for my “stuff”. I will try to figure out how to upload a picture of all-my-own mess. Unfortunately l can not send a picture of my sewing space, it is under construction. Redoing a room in my basement to accommodate a large cutting table that my husband made me as well as a new Bernina 750. Very excited! In the mean time l am sewing in the family room, although it allows me to sew it is a bit of a challenge. When the room is finished l might never come out! Lol! I’m celebrating by taking a class at my Bernina store to learn new sewing technics and how to use different feet! I can’t wait for it to start! And I can’t wait for the NEW 500 SERIES BERNINAS!!! I have mine ordered already! it sounds like an awesome machine! I am sorting things out… have a great bedroom space for sewing and and office. This would be nice. I took over our dining room! Lots of space to really spread out all my quilting and craft projects! I love creating while being in touch with my family at the same time. 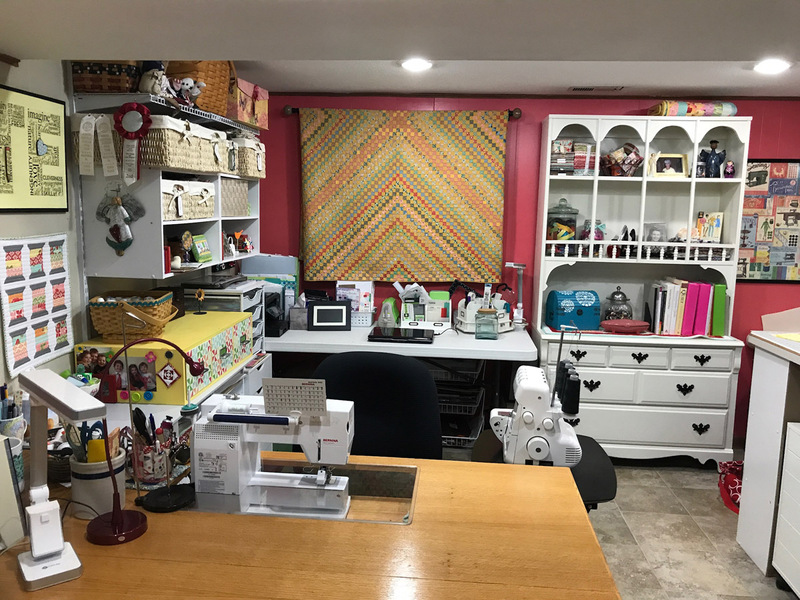 I have a great sewing room which now has my new B790 plus! I have grandchildren to sew for and I now give out more handmade xmas presents. I like sewing bags and quilts and things for the house. I’m not too good at sewing clothes but maybe some day! I have a question – does anyone know what the dvd that came with the machine is for? just wondering…..
also, has anyone had the problem of local dealers not letting you take their classes because you didn’t buy the machine from them? I don’t mean the mastery classes, just classes in general. My sewing room overlooks the backyard on the second floor! My boyfriend gave me the room when I moved in! It overlooks our gardens and city! The best place to get inspired! 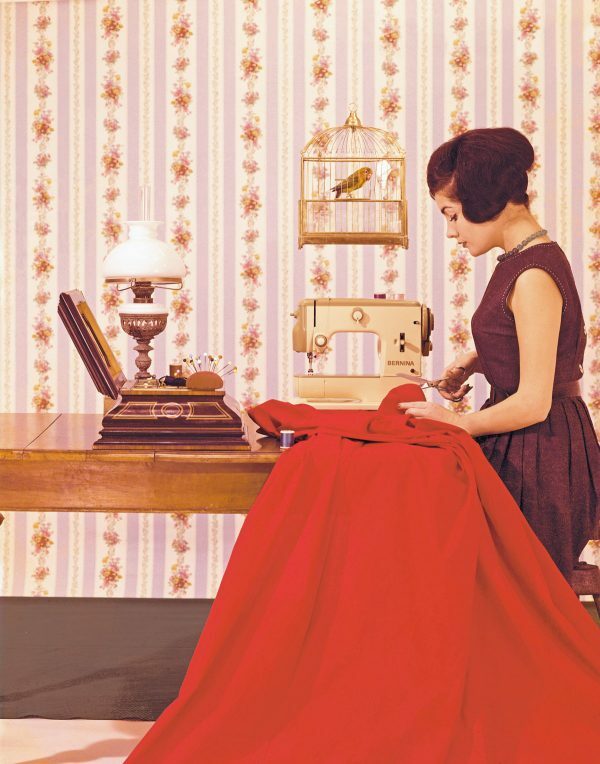 I have an antique Singer Featherweight that I have been using for my sewing projects. I would love to have a new Bernina 215 Simply Red, it would supercharge and simply my sewing projects. I could just imagine this machine boosting my creativity and productivity. I have a space in my spare bedroom that I could dedicate to sewing.This would really make my day. Thanks. I have the upper landing with good light, windows and wall to wall closets. Two office desks, an farm house table and a cutting table all backed up to each other making it a wonderful area for laying out quilts and for making a large mess!!!! I am a lucky person but now if I only had a new BERNINA. I have an Artista 165, a pfaff, an really old singer and a old serger but really need a new BERNINA. Because there is nothing like a BERNINA I have sewed on the 880 and the 790 but they are way out of my reach, so I keep buying lotto tickets, if I win anything it will go for a new Bernina. My light comes a 5 bulb ambient light, the light on my bernina, a hanging light over my ironing board and a big window that looks out at my front yard. Wonderful spaces everyone! I hope you all find sewing happiness wherever you choose to do it. By the way, who won?